First Line: "Why did you move the body?" Dade County chief detective Jane Bunker decided to turn a new leaf-- and it was a big one. Quitting her job, she returns home to Green Haven, Maine, as a marine insurance investigator. On her very first assignment, she finds the body of Nick Dow, local alcoholic, washed up on shore close to the fish plant. With her background, Jane's quick to take an interest in something she feels is more than a drunken lout staggering off a pier and drowning, but when she tells local law enforcement that she's been in Maine three days, Jane is told "Green Haven ain't Cabot Cove, and you're not Angela Lansbury." Not that Jane is contrary or anything, but given that attitude towards her, she decides she can investigate a murder while she's investigating insurance claims. Greenlaw has created an extremely interesting main character backed by a whole cast of memorable townspeople. Jane's landlords are good at wining and dining her, but they do not understand the meaning of privacy, wandering in and out of her apartment at will. The manager of the fish plant is ill-tempered and untrustworthy, while her foreman is a sweetheart. And it doesn't take Jane long to learn that there are all sorts of things going on in that small town. This is a fast-paced book with lots of depth. There's so much going on in Green Haven that it takes time to unravel all the clues and red herrings to figure out who- and whydunit. The setting is pitch perfect, and it should be. 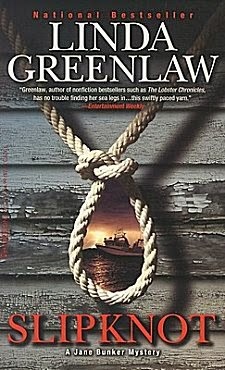 Greenlaw is a deep-sea fisherman and captains a lobster boat in Maine. She knows her stuff. As Jane performs the tasks of a marine insurance investigator, I learned so much about the inner workings of these hard-working vessels and the many ways that cash-strapped fishermen can attempt to file insurance claims. But the best part of Slipknot by far is the section when Jane finds herself with the killer on a boat heading straight into a storm. Wow! Absolutely mesmerizing action that put me right on the boat with her. I'm glad I have good sea legs; otherwise, I could've gotten very seasick. Slipknot is so good that I'm glad I got my hands on the second book in the series, Fisherman's Bend. I can't wait to meet up with Jane Bunker again! Greenlaw is known more for her non-fiction. When she mentioned something to her fans about a desire to try fiction, they encouraged her to do so. I only see two mysteries at this point, so perhaps the desire was a short-lived one. I hope not! Yes... I definitely wouldn't recommend that either!